Jon…this is an outstanding tutorial, even by your standards. Thank you, thank you, thank you. This alone is worth the price of the several excel reporting and charting books I purchased that – rather annoyingly – don’t have this essential charting info in them. An VBA object list described solely by visual worksheet examples. I’ve never seen a presentation quite like this. I think you’re on to something good here. When I went through this myself the first couple dozen times, I’d go to the Object Browser, read what it said, then when it wasn’t very clear, I’d run exactly the code I used here. Nothing like seeing something to understand it. Since few people are going to dig as deeply and obsessively as I did, it seemed like a good idea for a tutorial. If two smart guys like it, then I was on the right track. Make it two and a half smart guys. This is great. I’m sure I’ll refer back here again. A few months ago I created a pivot table class, partly to teach myself this stuff. As part of it I created functions to return the row and column grand total ranges, because I didn’t see any vba properties for them. Here’s the on for the Row Grand Totals. It seems to work. What do you think? This works fine. Pretty much any range manipulation you can envision will be helpful. This article is to help people envision the pivot table structures in terms of properties of the Pivot Table object. Hi Jon. I’ve a couple of questions for you re this post. 1. Where you have “Dim pt As Pivot Table” above, should this be “Dim pt As PivotTable” (i.e. PivotTable is one word with no space between Pivot and Table)? In 2007 I need to take the space out to get your code to work. 2. In the case that you have the Pivottable’s Years field in the columns area, how would you select say the readins for Feb only for the years 2003 – 2005? 3. I have fields formatted as date/time information across the top of my pivottabel, and I amend your code accordingly, I get an error “Unable to get the PivotItems property of the PivotField class”. That is, your code can handle columns that are formatted as text, or even numbers that are formatted as text, but not numbers or dates formatted as dates. For instance, The code works if I rename the pivot columns as text such as “a”, which obviously forces Excel to treat it as text which your vba can handle. …and in both these cases, what I type in is automatically left-aligned as opposed to the original pivotfields, which are all right-aligned. Interestingly, if I overtype 1/11/2008 with the number equivalent 39753, Excel doesn’t format it as text and the code fails. But if I then overtype 39753 with “a”, and then overtype “a” with 39753, excel treats it as text and the code works. I take it from this that I need to amend the VBA in some way to tell it i’m looking for date/time information, not searching for text. Do you have any idea if this is the case, and if so, what kind of statement I need? 1. Yes, there is no space in PivotTable, good catch. Hi Jon. That’s great. Sorry, 2 more questions for you on this. (You are probably going to cringe when you see how little I understand of VBA…I’m still working my way though Walkenbach’s Power Programming). to select say Feb’s figure for 2004 and 2005, but not 2003? Sorry for the stream of questions. Keep in mind that you do not need to select something if you just need to extract the data. Is there a way to apply a conditional format to a Pivot Table that would Bold Font and Highlight in Yellow entire rows that have met a certain condition in one of the columns? You can use the same conditional formula as you would with a worksheet range (non-pivot). If the pivot table resizes, you’ll have to reapply or remove the conditional formatting, but if the pivot table refreshes without resizing, the conditional formatting works fine. 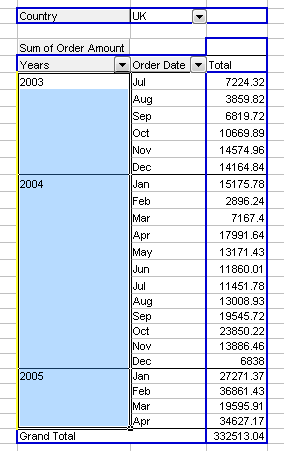 I tested in Excel 2003 SP3, and the pivot table had three row fields and one data field. The data came from a list (“table” in 2007) and the data field values were volatile random numbers. Pressing F9 then refreshing the pivot table resulted in the formats updating to reflect the new values. Even when I try pressing F9 (?) and refresh it will drop columns (from =$B$10:$V$109 to =$B$10:$D$109. (Only formatting my Row Labels, and losing formatting on all of the Values. Because of this I was hoping I could include something within a Macro (that currently just does small things like column size adjustment) that would also update the conditional format Applied To Range. I haven’t used conditional formatting much in 2007, and I haven’t programmed conditional formatting much in any version. If you have to use VBA to reapply conditional formatting every time the pivot table is refreshed, you might as well take the easy way out, skip the conditional formatting, and apply the formatting directly in the VBA routine. I’ve written up an example in Pivot Table Conditional Formatting with VBA. Thanks for the blog topic. A quick question if I may, I am using your code to automate the formatting of a set of sheets with pivot tables, all of which are different . My aim is to open a the workbook, change the source data for the day click refresh all pivots and have all the pivots format themselves. I have been using the below code to format all the pivot tables. However when I use pt.ColumnRange.Select & pt.DataBodyRange.Select I cannot get it to work unless I use your code specifying pivot table 1. 1. You’ve neglected to say which version of Excel you are using. 2. I see no references to ColumnRange or DataBodyRange in the code. 3. I removed the ColumnWidth stuff, and the rest of your code ran just fine in Excel 2003. I was wondering if you know how to add comments to a pivot table via VBA. and I would like to add any comments to the data field as a little red marker in the top right corner of the cell if there is a comment for that value. Range("H6").Comment.Text Text:="Jon Peltier:" & Chr(10) & "Low sales on this day"
Range("H7").AddComment.Text Text:="Low sales on this day"
It’s up to your code to identify the cell that should get the comment, and to remove comments when they are no longer applicable. I can identify which cell to add the comment to but the problem is getting the text form the comments field actually into the d.addcomment “test” part above. Rupert – Are the comments visible in the pivot table? Yes, I get a comment in the cell. 1) I have to add the comments field as a data field – “count of comments” – and do a count on it so it is visible. I then have to add a comment to the same row, previous column in the value data field if a value exists in the “count of comments” data field, and then hide the “countof comments” data field. 2) i cant seem to extract the actual comments text from the comments field into the inserted comment in the value data field. Let me know if you want me to send a sample to you. Hi Jon and thanks for the above info it was helpful and insightful! The PT comes from a table of test records with 30 columns and 15k rows. My PT is setup but I have to manually uncheck “Show All” and search for and check-off 200 serial numbers in column 1 of the PT every three days. Can I point my vb code to a list or range cells and exclude everything in the column which is not in the column I specifiy (f2:f32 or A1 to A201) from another sheet? PT headers are as follows: SERIAL_NUM, CAL_DATE, CAL_TIME, SLOT, ERROR_MESS, ect. and all I need is SERIAL_NUM visible equal to true for 200 of the 15k serial numbers available. Does this make sense? this cell is not inside in the datarange ?. as do I reference the column grand total ? Jon this is quite a useful article. Definitely the closest thing I’ve found to what I’m looking for. I was hoping this might be an appropriate place to take me the last step. I see above that using VBA, there are easy ways to return whole ranges from a pivot table that will dynamically resize. However, is there a way to fetch a pivot table range from a formula that might reside on another worksheet? Basically, I have two separate pivot tables that contain some different data. I also have some formulas on another worksheet that reference ranges in both of these tables to do some calculations; for example, one of my formulas would include LINEST(). In my formulas, I would like to reference the pivot table ranges, which may change as I manipulate what’s displayed on the pivot table. Is this possible to do with formulas? All I can find so far is the GETPIVOTDATA() function, but the documentation indicates that this is only for the summary data, whereas I want to operate on the range itself. Hmm, that is an interesting way of approaching this problem, and one that I had not considered before. I’ll give it a shot and let you know if it works. The concept seems like it should, though. Great post, extremely useful as an introduction. When you have two calculations, we then have a pivot field names “data” (données in french). In order to keep international compatiblity, do you know a way to capture the range of this cell. I think I should only look at rowfield and columnfield for “data” as I don’t think “data” could be a datafields, neither could be a pagefield. That said, as I don’t know in advance what will be the orientation of the data, I preffer to scan every possibility (I guess this could be specific to my problem). Beside the speed, do you see any other inconvenient? In general there isn’t any real inconvenience to cycling through items in VBA. The computer does it behind the scenes, and if there isn’t a huge number of items, the user will not notice. I made good use of your Pivot calls for vba above. I tried getting the “Grand Total” field and failed using pt.PivotFields(“Years”).PivotItems(“Grand total”).DataRange.Select. Is there something different about that column. Sorry, I may have missed something. The totals are not distinct fields, but are part of the DataBodyRange, if the totals are included in the table. The code below bolds the column of row totals, italicizes the row of column totals, and shades the grand totals light gray. The grand total will be bold and italic, since it’s in the row totals and column totals. Excellent article, but could you give me the equivalent way to reference PivotTable properties in MS Access (say 2003 or 2007)? I am trying to change the ‘Fill color’ property of a ColumnAxis field using VBA. The next line doesn’t work. I have tried FillColor, BackColor, SubtotalBackcolor, but I just can’t reference this object correctly. Do you know how to reference this object so I can update the ‘BackColour’ property with VBA? Michael – You’ll have to ask someone who uses Access. I’m trying to create multiple pivot tables using a pivot cache from another worksheet. I just keep modifying the same pitot, what am I missing? When I do this manually, I copy the original pivot table, paste it where I want the new one, and modify the layout of the new pivot table. This might be easier in code as well. I have: Set PTCache = ActiveWorkbook.PivotCaches(1) ‘where 1 is the original cache i wish to use. I’ll try your idea of merely copying the table and then use the With command to alter the layout as you suggest. The complication also arises in that i’m using the field values pf.PivotItems from the original pivot table to create 32 different (new) pivot tables in a new sheet. p.s. your visual tutorials are indeed helpful and will come in handy. This post is wonderfully helpful! I have a followup question: how do you reference data labels in a nested pivot table? For example I have a pivot table with two columns (number and percent) under each data label (original and revised). but I’m not sure how to select the sublabels, for lack of a better term. Hope that makes sense…looking forward to any guidance you can offer. Thanks! Adam – The macro recorder is your friend…. Found my error…incidentally it was very simple, the Row +30 wasn’t enough to allot for the new pivot. Now the code works. When all else seems right…it is…look for the simple things and most often that’s it. Jon…using Excel 2007, if I use pt.PivotFields(“Years”).LabelRange.Select then it just selects the header “Years”only from the pivot table and not the items underneath. 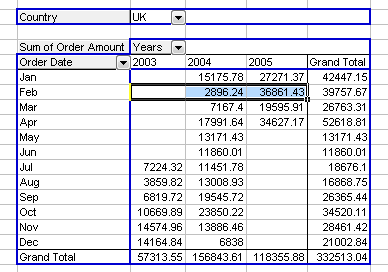 If I use pt.PivotFields(“Years”).PivotItems(“2004″).LabelRange.Select then I’ll get the 2004 items, same as you do. This might be a case where you have to build the range you want using Union() and Intersect(). 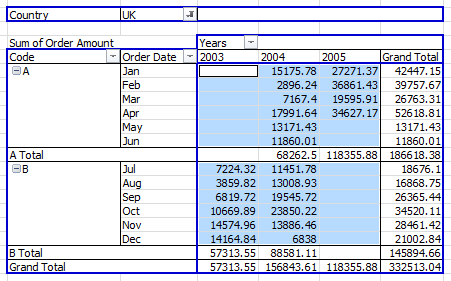 The problem was that the pt.RowRange.Select command (the way you are using it without the optional arguments) works differently for a pivot table constructed in excel 2007 than one constructed in excel 2003. * In a pivottable created in excel 2007, if you don’t supply the optional arguments then the default is to just selects the headers. *In a pivottable created in 2003, if you don’t supply the optional arguments this selects the headers and all the rows below. (note this happens for an excel 2003 pivottable that has been opened in excel 2007 too). Note that this is not what the help file says it does…the help file example supposedly selects just the row headers on the PivotTable report. Looks like an error that it’s working the way it is in 2003 to me. RowRange takes 2 arguments…a rowindex number and a columnindex number. Then it works like an index function i.e. it drops down x rows according to the rowindex argument and across y columns according to your columnindex arguement. So pt.RowRange(3,1) will select the cell two rows under the first column heading i.e. row 3, column 1. Note that pt.RowRange(3,10) will select a cell in the data area (because you only have 2 columns in this example, but you’ve asked excel to keep on heading west). So if you provide a columnindex number, this function doesn’t restrict you to returning cells from your row fields. However, if you omit the columnindex and just use pt.RowRange(3) then excel starts counting cells from left to right, dropping down whenever it reaches the last column in the row area (in this case, column 2). So you’ll be selecting column 1, row 2 of the pivot table. Gee, an inconsistency between 2007 and 2003. 1/2 of my recent project work has been building ribbon interfaces for projects being upgraded to 2007, and another 1/4 has been finding and programming around such inconsistencies. It keeps the revenues coming in, but it’s not very challenging or interesting. I am new to pivot tables so I found your post extremely helpful but I could really use your help solving a problem. I am trying to create reports for specified time periods which will be defined in two cells (one for the start date and the other the end date) by the users. I was hoping that the code below would achieve this but I get an error and usually only display the last date. I have even tried adding a false condition thinking that was missing but I still get errors. I really appreciate your time. pt.TableRange1.Select – getting a Range example A1:D8 something like that. Due to the changes in the raw data and there are many of such pivot tables with different conditions and the process required after that i cant just create another pivot table with the condition i want. Nicholas – I don’t understand. Could you explain in a bit more detail? Sorry, i will like to make individual Charts of the Pivot table and as well as a overall View. In my Overall Table i am required to update the Grand Total For each category( which is Example 1 to Example 4 as shown on my Data) and i have about 2 – 3 different Overall Tables so with different combination and after that i required to do a chart and also using the chart i need to do many other function which by using pivot table i am unable to access. its something like that. sorry to trouble you. If your data were shaped differently, it would be easy with another pivot table and without code. Keep columns A through E as is, put the example label in column F, and put the True/False in column G. You will have four rows per S/N with the other data repeated in the new rows. This way, you could put column F into the rows area of the pivot table, Column G into the columns area and into the data area, to get your summary. If the hidden label for the rows area is “Class”, you can also get your pivot tables from the new data arrangement: put Example (column F) in the page area, and column G in the data area and in the columns area, and Class in the rows area. Thanks – this site is a great reference. My quest is regarding Grand totals. Your reply to Robert with “Sub SelectGrandTotal()” helped “break the logjam” for me. I did arrive at a solution. However, it seems inelegant (and isn’t elegance in coding what we’re all after? 8^). Using your above PT example, I’ve been trying to grab specific Grand Total values. Again, is there a better way to get ‘sDataValue’ with having to resort to row/column matrixing/intersecting? Let me preface my reply by pointing out that elegance in code is overrated. Now, if it works, that’s elegant enough. Whether it’s more or less “elegant”, I don’t know. I didn’t bother to fill out the whole sub, so I can’t even gloat about mine being done in fewer lines. Thanks – thats much cleaner. Hey – one less variable – thats elegant! Hi Jon, excellent write up. Used most of your you posted code for formatting Grand Totals above, but I’m having trouble finding how to get to the totals in column L. Hoping you might point me in the right direction. I can’t seem to get to anything in column L, Label or Data Ranges. Also, I’m not able to find a way to alternate the colors of the drives as shown above. I’ve tried everything, and all I can get is all drives as one color. To get the total of one of the column fields, you need to determine how many column fields there are, and the index of the desired column field among all column fields. There are as many column field totals as column fields, and the index of the total is the same as of the column field. Lots of intersect-type range definition. You’ve defined colors for the LOCAL and SAN parts of each drive. To define individual colors for each drive’s LOCAL and SAN data, you’ll need to use Intersect(Drive, Data) to identify the range. Don’t leave off the properties of the various objects. The default property may not be what you expect. Also, CurrentPage is not defined if the PivotField is not a page field? the problem is that when you copy data to another excel sheet everything is perfect copy raw data, then copy the format for the 19 entries, but I see the excel as having selected or openness, but plain cells but is selected as 1046215 incredible, so in this line of paste forms takes too long and slows the process. In Office 2000 is fast I have no problems but it is slow in Office 2007. You know that is? Orison – What did you copy? Now I have new problem. The problem I have is that my whole process of copying data files to generate an Excel spreadsheet to another sheet Excel etc filtering data erasing data. When I run everything on Office 2000 there was no problem at all, everything was fine. Now that I’m almost finished the migration to the version of Office 2007 I have many problems, I’ve been spending almost all problems, I have almost resolved. Now I face the latter problem and story. Copies data from one excel to another excel, format and copy it all and as far as copying, also copy an image. Intel Pentium Core 2 Quad Q9400 2.66Ghz with 3.21 GB ram. Yes, Excel 2007 seems to have problems with shapes and images in workbooks from earlier versions. 3. Use .Move instead of .Copy to insert the sheet into the other workbook. Then make sure you close the source workbook without saving, so the copy on disk still contains the moved sheet. Other remedies involve chicken livers and incense at midnight. 2.-It is possible to use VBA in Excel 2007 to bring data webservices? what happens is that I have to create a login and user in order to access the Oracle database and can not be used directly for security Single Sign On and recommended me to do it for webservices, you can really do that with VBA? Thanks for all the support and assistance. 1. I haven’t used Oracle in this way, nor have I done much with this kind of query. My first step would be Google. 2. You can use VBA for this, and again I’ll refer you to Google. I am trying to figure out how to read the contents of a PageField when EnableMultiplePageItems is set. The CurrentPage property of the field is set to a PivotItem whose Value is (All). All PivotItems are visible. The VisibleItems is set to an item whose value is (All) and each item is listed in teh HiddenItems list. Hi, I have a goal to accomplish. This is the macro security. I currently use plug-ins (*. XLAM) but the truth is that they tell me they do not believe they are very safe. The master sheet (*. XLSM) is the one that has data entered or better *. XLSM data feeds and webservices *. XLAM is responsible for making all the math formulas and all the data. What I would like to know, under this scheme, which could be safer? XLAM stop using and instead use either *. DLL developed with VB 6.0 or. NET? What do you recommend? Who says this? How do they define “safe”? Do they really think an XLAM file is less “safe” than an XLSM file? Using an Excel add-in is a much simpler process than using COM or .Net, it’s “safe”, and usually it’s sufficient for the job. I want to tell which is the reason why I seek a more optimal form of security. 3.-The user runs the master Excel (*. XLSM) and you enter data, in turn, the master file makes use of component (*. XLSA) to make calculations and generate data, files etc. Hey here an important issue, we talk about security. The fact that the component (*. XLSA) and is in a remote desktop, a program could easily crack the key and see all the code that XLSA. Is it possible?, I have experience with DLL and COM issue but it is doing all a long, long or at least maybe use a special program to ensure XLAM *. When you said “safe”, at first I thought you wanted to keep the computer safe from malware. You could certainly build a DLL for the code, instead of using an XLAM file. This adds some security, some complexity, and probably some decline in performance. Is this a commercial product? If not, what’s the big deal? Is an application will use people outside of the company with confidential information. What we want is to protect all possible files (XLAM and XLSM) and can not be easily hacked. Can you design the project so that the code is kept separate from any confidential information? Let the information be provided by the user, and processed by your code within the user’s workbook. Then keeping the data safe is completely within their control. I have a question hopefully you could help me with please. On the left I have the category of work he did on that date and in the middle I have a sum of the amount he was paid gotr each category of work. Once I select a date (filter) there are about 50 builders (filter) which I can select. Each time I select a new builder the pivot table populates with his info. Hi Jon. I’m unsuccessfuly trying to build a pivot table via VBA from data in one workbook and have the resulting pivot table placed directly into another workbook (as opposed to another worksheet). Do you know if this is possible? But this code (with SourceData qualified with [pivot_source.xlsm] and TableDestination qualified with [Pivot_Destination.xlsm] does not. I get the error ‘Run time error 5: Invalid procedure call or arguement’. Does this mean this can’t be done in one step? Reason why I was trying to put it directly into a new workbook is that the source workbook is write protected, which I would otherwise have to remove. I should have consulted the help menu first. Perhaps I can do this programatically by first opening a new workbook with vba, then setting up a connection string that goes from the destination to the source, then building the pivot table using that connection string (i.e. via the ‘use an external data source’ option on the pivottable dialogue box. as long as the destination workbook “Dest.xls” is open and it has a sheet named “Destination”. Doesn’t matter whether the source or destination (or any other) workbook is active. By specifying the parent workbook of the pivot cache, you avoid any problem of the pivot table and pivot cache being in different workbooks. Thanks Jon…I simply forgot to qualify Pivotcaches.add with the right workbook. There’s 2 hours I feel stupid about! I was just thinking about how many people you must have saved hours if not days, and I thought “It’s about time I clicked that ‘Buy me coffee’ link and see where it goes”. But now I can’t find the damn thing. I see from another comment elsewhere you’ve removed it because it was pretty much a distraction. But then, so is answering my queries on behalf of my employer! Great stuff, I’ll send you a get out of jail free card or something. Is “ESTRIBO” a built-in function in Spanish, or is it the name of a custom function? You may need to use FormulaLocalR1C1 rather than FormulaR1C1, if “ESTRIBO” is the Spanish name of a built-in function. I don’t know what to say about the DLL. I’ve read your tutorial with great interest and the points raised have been a great help. I do have a semi-related query to which I cannot find a solution. I am creating a pivot table which summarises a large number of daily readings from some CSV files . For presentation purposes, I need to hide the first and last days as the data for these two has to be excluded. I have no problem in hiding the last day (“EndDate”) but cannot hide the first day (“StartDate”). My code is shown below. “EndDate” and “StartDate” are already dimensioned earlier in the code as Dates. I am a rank amateur at VBA so the answer is probably something very simple but would appreciate your help. Thanks for your suggestion. I can confirm that the earliest pivot item matches the StartDate. However, the use of the “<" symbol hides 9 days instead of just 1, irrespective of the number that you insert after the symbol. I don't suppose it could be a function of the date being in a European rather than a US format, could it? Step through the For Each pi In pf.PivotItems code, and see what the StartDate and pi values are. Also, try pi.Caption instead of pi.Value, in case that makes a difference. In my pivot table “Data” I have a “Month” field that contains a difference from column of “MoM”. What I need to do is, if the cells in MoM are >0 then make it green, if <0 then make it red. Thought it would be simple enough after reading through this and the other related post, but I keep messing it up. Reading external data etc. 999.99% Everything is Ok but there is a problem and can not find the way resolve. EXTRAE and LARGO function is inside a DLL in the new version. The reason for not supplements work is for safety, I prefer all my work with DLL functions with accessories. Where parameters can give if I want to make a change for me a whole range or cell to cell or else something like that to a LostFocus When the cell loses focus make the change or call a function and make calculations. This might be a simple conditional formatting task. Select the range, go to Conditional Formatting (Format menu in 2003, I forget where in 2007), and apply a simple rule of >0 is green and <0 is red. Yeah, you’d think so :P but (and I don’t know if this is a 2007 specific thing) when you refresh your table, all conditional formatting is lost, hence the vba route. I actually found a way to get it to work for filling the cells but the same doesn’t work for font colour. Strange! All the code is at work, so can’t post the example here. I’ve also been asked to try and get the conditional formatting icons to work… which it kinda does with an example I found, until the table is refresh and all the icons show the wrong thing. to calculate a specific range and it’s dependent cells. Actually, managed to grab the two examples. The first is for filling the cells, which works. The second is for the icons, which I still need to fix. Does the pivot table stay the same size? If so, move it out of the way, and set up another range that is linked to the pivot table (copy the pivot table, and use Paste Link). Then apply your conditional formatting to this pasted range. It’s an ever changing table I’m afraid. Contains information for multiple countries, so the idea is you use the filter to view one country at a time. I believe I’ve isolated the problem that I’ve been having with my “pi.value” settings. It boils down to date and string formats. My StartDate and EndDate are dimensioned as Dates which are formatted in UK style dd/mm/yyyy. when I run the macro, the pf.numberformat is shown as a dd/mm/yyyy string but the pi.caption shows a string in US format mm/dd/yyyy so consequently does not recognise the StartDate and EndDates. As an example, my StartDate is 07/12/2010 in UK format but pi.value is interpreting this as 12/07/2010. Consequently, I am getting a result where the macro is hiding the dates from 07 to 11/12/2010. This would also explain why my original didn't work either. Unfortunately, I can't think of an easy solution to this. VBA should know the correct date, provided your regional settings are consistent. If your date is 7-Dec-2010, and you write it as 07-12-2010, VBA may call it 12-07-2010, but it will know it as 7-Dec-2010. You could see if using the dd-mmm-yyyy number format helps, or you could test the formula of the cell (which for a cell without a formula is its unformatted value, 40519). Problem solved. It is a date format issue. The pivot table defaulted to the system date settings “m/d/yyyy” so by changing these via the pivot table macro to the the format “dd/mm/yyyy;@”, I can now get the correct result. It seems a bit obtuse but it works. Hi have a really really problem, buy i can’t copy imges from excel file, i don’t understand. really understand it is due. Has anyone had similar problems and has been resolved? I’ve seen some funny stuff in Excel 2007, where certain operations involving charts (and presumably shapes as well) don’t work right if ScreenUpdating is False. This is very frustrating, because (a) procedures slow way down when ScreenUpdating is True, and (b) it’s impossible to know a priori which operations will misbehave. Unrelated, but you should be aware that ThisWorkbook is the one containing the code, not the one you just opened. Also, you should avoid using a keyword like “Name” as a variable name. and ADODB.Connection for copy ? mmm will work with images? ADODB? You’re asking the wrong guy. But I think that will only extract numerical data, not any images in the Excel file. Maybe you could store the path and file name of the images (stored independently, not embedded in a worksheet). You can extract the addresses using SQL, then insert the images using their file names. This is an excellent resource for VBA learners and I really like your illustrative examples. In addition, all the questions being asked and provided solutions are extremely good learning aids. I’m farily new (3 months) to VBA and stll picking up things. I hope you can help with my below query. I have some code which updates multiple pivot tables across multiple worksheets based on the last 8 columns of a dynamic range within each worksheet. The range row number and positions are always the same in each worksheet but an additional column is added each quarter for that quarters data. My problem is that I now have a workbook with a similar kind of format where I would like to refresh multiple pivot tables. However, in this workbook, within each worksheet, there are 3 pivot tables which use one data range as source data (same range across each worksheet), there is 1 pivot table which uses another range as its source data (same range across each worksheet), and another pivot table which uses another separate range (again the same range across each worksheet). Can I specify a particular group of pivot tables based on their name?? Set rng = Range(“specified separate range”).currentregion…………. Any help on how I can specify a group of pivot tables so that the source data on each individual worksheet can be set for each pivot table in that group and then loop through to a new group of pivot tables would be greatly appreciated. I might have set up your source data differently in the first case so all my data goes into the same column, but there is another column indicating which quarter the data belongs to. The source data becomes longer not wider as time goes on. There is a column field for the quarter, and there is a single data field. The column field would include only the last N entries: this is what you might need code for.
' What to do... Tell user there's an unknown pivot table? I found your tutorial very helpful for some of my projects. There is, however, something I am struggling for several days already and I just can’t find the right way to do it. I have a simple pivot table with two fields in the row part and one in the data part (The columns and page parts are empty). Next to the grand total, there is a total for each of the pivot items of the first field. What I would like to do is select the row totals per pivot item display the data on a new sheet in the same workbook (for this I use the GetPivotData function). Subsequently this new sheet should be given the name of the respective pivot item. The problem is that the number of pivot items would change depending on the data. Could you advise me on how to deal with this issue? If you’re looking for a programmatic approach, you may want to write a procedure that loops through each pivot item in a pivot field, then puts the name of the pivot item and its total into a new sheet, assigning the pivot item name as the sheet name. GetPivotData causes me to pull out my hair. This is exactly what I want to do. But my basic VBA knowledge does not allow me to get the loop working right. I am getting messed up with the syntax. Would you suggest an example I might use as a guideline for my project? It helps to know the syntax you’re having difficulties with. Below the part of the code where I want to loop through the pivot items of a particular pf (“AC Owner”) and display the row total for each pi in a separate sheet and name it after the pi name. I have s2 defined as worksheet, pt as pivottable, pf as pivotfield, pi as pivotitem, mycell as range. I get an error with pi.Name. I don’t know what I am missing in the code. Any help will be much appreciated. It’s me again. I almost got it working. I went through the comments again and made some adjustments of the above code. Everything works fine, except from selecting the grand totals per pi. Every time the loop runs, the grand total for all pi’s in the pf is selected (so basically the cell in the right bottom of the pivot). The issue is now with the way rColumnTotal is defined. How can I get this counting only the row grand totals per pi? You might not be selecting the appropriate ranges in your Intersect statement. I had the impression you wanted the total in the last column, not in the last row. If ColumnGrand is true, it means you have column totals in the bottom row. What the last posted code does now is getting the Grand total (11 in this example). What I want to do is to get the total of AAA Total (3) – select the cell and display the data into a new sheet. The same for BBB Total (8) and any other existing pivot items totals. My original code worked ok prior to the selct case block so I’m assuming it may have something to do with that? field2 = rng.Cells(1, (lastcol) – 6).Text ‘ not sure if the .text is required?? Do you have any ideas why the Select Else block would provide an error?? Why not give the pivot tables descriptive names, “ptSales”, “ptExpenses”, etc.? Why do you need to keep redefining the source data range of the pivots? What changes about the range? If you converted the range to a list/table, would this accommodate the change? If so, all you’d need to say is pt.RefreshTable, not the other 99% of this code. About the error: “The Pivot Table field name is not valid.” Are any of the cells in the first row blank? Or are they otherwise unsuited for use as a pivot field name? Jon, this code works fine in Excel 2003, but after saving to Excel 2007 it fails, any ideas? You don’t say what the error message was, or on which line it occurred. Maybe use CurrentPage.Name before the equals sign? I am pretty much a novice at VBA, reading up on my spare time…. But I am looking into simplifying a task that I normally do. I would think there’s a quick an dirty code to write, that I am not grasping yet. I have two pivot tables ( one on top of the other) on one of my spreadsheets that “refreshes” each time a data dump is created, which increases the number of rows the pivot tables read from. I would like to have the rows in between the two pivot table to be deleted, so that they are about 3 rows apart, each time after the PT refreshes… My template currently separates them by about 200 rows to allow for the refresh. Is there a way for VB, to calculate the number of rows it needs to delete; in order to leave just 3 rows, between the last row of the top PT and the top row of the bottom PT? First, you’d better insert enough rows before refreshing the pivot tables, or you’ll get warnings that pivot tables can’t overlap each other. How about keeping 1000 rows between the pivot tables, and hiding whatever rows you don’t need? You could do this, as long as you made sure to insert enough rows before the next refresh. But I’m sure I would forget, then go through the warnings, etc. Re my post on 25 february and your reply. My pivot tables are dynamic which is why I keep redefining the Pivot table Source data. An additional column is added for each month. With your help and some step by step testing I found that my calculations associated with my Last Cell function were not correct when sourcing a different data range meaning that I was referencing blank cells for my Pivot Table field names. I have now amended the code and it works fine. Glad you’ve got it sorted out. Sometimes it takes a few painful iterations. Hi Jon, I’m beating my brains out with this one…..Do you see anything wrong with this. No errors, nothing, just doestn’t work for some reason. What happens if you step through the code? I found that VBA does not play well with parentheses in the column name. I changed to brackets, and the code works fine. Thanks for your reply. I tried using the recorder 1st to start in cell A1, edit find total, offset 6 columns then calculate March less February. I can get it to work one time, but I need it to loop for every subtotal. The problem I’m having is trying to get it to not reference the vendor name in the subtotal so it will loop. Any help is greatly appreciated! Angie – Your description is not complete enough for me to comment. What I am trying to do (which is also outlined in my code comments) is format my Data Range and Total Range, but I am having a hard time selecting them. I do not have an X and Y setup like you, where you have Order Date on the Y axis and Years on the X axis. Instead, I have a column for PLAN, a column for PLAN TYPE, a Data Column and a Total Column. How do I select (or add to a range) just the Information for my Data column (not including the totals at the bottom) and the same thing for the Total Column. Basically, I want to find PT.DataBodyRange. (minus the last 2 rows). Hopefully this explanation makes sense! This allowed me to format the two columns which I couldn’t identify directly from your examples above, as my pivot was not laid out like any of yours! I’ve found this article very useful to start understanding pivot manipulation via VBA. In my workbook, I have a table with 2 rows (let’s call them Row1 and Row2 ) and no column, but with the count of a value in the data range (count of Data1). I’ve tried to use the same methods shown in your example, but I cannot make them work properly. 1) If I use the intersect method to select the cells of R2 corresponding to a certain R1, the selection is fine, but if I assign this to a range, the range is way bigger than the selection highlighted on the screen, including cells after the ones I want. This happens both with a PageRange filter that without one. How can I select the correct range, that is the one that it is higlighted? 2) Moreover, in my pivot I have a row of totals for each value in R1 (as if there was a total for 2003, one for 2004… in your example). Is it possible to select that total value? Because it doesn’t belong to the data range of a specific entry (e.g. pt.PivotFields(“Row1”).PivotItems(“Value7”).DataRange.Select), or at least to the part that is higlighted, because also in this case if I assign a range, it is bigger than the higligthed part. I don’t have any questions for you thankfully as it seems you have your work cut out here! I just wanted to say thanks for an excellent resource page – I was stumped on some of this stuff, and was using code to identify the start and end of ranges based upon ‘last row/column containing a value’ to define the range limits. Obviously why do in 1 row of code what you can do in 235!!! Thanks again – my debugging is sooooo much simpler now – now, where’s that ‘Bookmark this page’ command…? As far as I know, ADO only looks at the values of cells, and has no knowledge of whether a cell contains an underlying formula. I don’t find the solution for my problem. I apply the filter CDL so and more use another filter from other CELL where I put the value of the YEAR example 2011. 2) So the sub printing the layout with nothing from select year, so I want to not printing, bypass the value for CDL that haven’t value into PivotTable_CDL. ‘ n_rec = PvtField.Function xlcount ???????? Probably a silly question, but I’m new to the VBA programmming. I’m working on extracting data from multiple pivot tables and before doing that I have to standardize the layout of the multiple pivot tables. Right now, I can’t figure out an easier way to filter pivot items. The pivot field (page field) is Coverage Date and it has about 12 pivot items and I only need 4 of them. Any easier way then visible.false method? Visible.False is pretty much how you do it. Inside a loop it’s easy enough. Hello i have a question/problem. I hope you can help me. I really need that (for work). Thats my Pivot table. I Input the dates. So it is possible that the order-number changes. Because my pivot is automaticly sorted by B1 “euro”. e.g. A3 “ccc1” C3 “15€” – new sum, new order. Can you please rebuild this one and give me the result vba code? Would you be able to provide a snippet of code that will simply copy an entire pivot table and paste its values and formatting over itself? The formatting does not paste in Excel 2007. Have you tried using the ‘Record Macro’ option to automate some of your actions? Yours is not a simple question or clarification related to this article. It is a pretty large project, and well beyond the scope of the article and beyond what anyone could answer in less than several hours. You’ll have to figure out the parts of your project, do some web searches, and follow up with some questions on a forum. Read Getting Answers For Your Excel Questions for guidelines. I have a xlsm file with macros in excel which has VBA code to generate some estimates. The data are not specific to the excel but are generated by VBA code, is there any way to delete setback when a data or more data? Just as when you write several cells and use the undo and I excel itself back or forward but I do not know if I let myself understand. How do I reference a pivot, by using the pivot name, rather using the cell address in getPivotData? Documentation for GetPivotData says you need “a reference to any cell, range of cells, or named range of cells in a PivotTable report”. The pivot table name will not work. You could name the pivot table’s table range 1 or even just its top left cell with the pivot table name, and use that. I’ve generally found GetPivotData to be more painful than useful, though I’ve never usually needed the functionality it’s best for. I might sound really stupid now but how can i select for example Feb in the 2004 part in the really last example? This works in the crosstab arrangement, when months are in the rows area and years in the columns area (or vice-versa), and also in the list arrangement, when both months and years are in the same area. You have to be careful of your formats. Are the dates in the pivot table actual dates? If so, they will not match up with a text value like “20/03/2012”. You might find that DateValue(“20/03/2012”) works. This will list the items in the Date field, and tell you if Excel thinks they are dates or text: there will be an error if you try to convert text to a long using CLng. You are right – the date in the Pivot Table needs a string value in the macro, not a date value to work. Many thanks for your help. Me again, Jon. If you’ve got multiple columns in your databodyrange, do you know whether you can select a particular column by name or index? 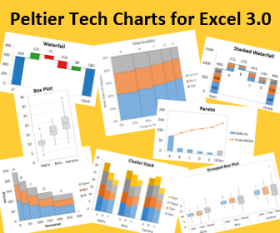 I know I can use Sheet1.PivotTables(“Scatterplot”).databodyrange.select to select the entire data area, but I’d like to individually reference the columns within it so I can write their address to a named range. I’ve got one called Sum of RETURNS_VOL and another called Max of MAX_AGE (Years). 2) there’s unlikely a better way that Jon hasn’t had to crack. So from here it should be fairly easy to write some code that cycles through each visible pivotfield in my pivot table, and add a new named range that points to it, so that I can have those names dynamically feed some charts. All this just so I can avoid having a @#$%ing pivot chart appear. This is a fantastic tutorial, thanks! At least, I think so. Confusing! Great to have this excellent tutorial here and still generating comments. I haven’t yet worked out how to do it with dictionaries. 'Here is where I would print the PivotField names, but you can't retrieve them with a collection. @ Jeff Weir, thanks for posting the code. I’ll give it a spin. No problem. Probably worth mentioning that the reason that I want to store PivotTable items in dictionary objects when they exist as collections already. Among other things, I want to be able to create ‘Custom View’ functionality that works for pivottables, so that the user can save their newly filtered pivottable, and at any time easily return to it, filters already in place. For anyone else reading along who’s not familiar with custom views, as per http://www.ozgrid.com/Excel/AutoFilters_2.htm custom views allow you to do this for autofilter collections by uing View>Custom Views and click the Add button (provided you don’t have any excel 2007/10 tables in your document – for some reason these conflict with the Custom View functionality, which is a damn stupid move on part of MS) . Give your view a name and make sure you have a tick next to Hidden rows, columns and filter settings. This is a must to retain all the settings. Click OK. You can then call up your filtered list as a Custom View by going to View>Custom Views, clicking on the name of your view and selecting the Show button. I want to do something similar with pivottables. So what I want to do is save my pivottabel settings somewhere (likely a hidden sheet), so that I can recreate it at the push of a button. I think the jagged array approach is going to be the best way to do this in terms of flexibility .. I can easily add further dimensions to hold other data regarding pivotfields, such as hidden items, number formats, whatever. Whereas with the collection/dictionary approach I would require a separate collection/dictionaries for each subsequent type of attribute, as far as I know. Also with collections, I don’t believe you can retrieve the key, so I won’t neccessarily know which set of filter items go with which pivot field. Although I could easily get around this by storing the subdictionary (i.e. the one that contains the pivotitems) in say the 2 element Variant Array; with the field name stored in Variant_Array(0) and the dictionary stored in Variant_Array(1). Note that this is a dictionary stored within a jagged array stored within a dictionary! 'First Character cannot be numeric & result cannot look like cell ref. @Doug…Ha…I didn’t realise you were the person behind yoursumbuddy, and that you’ve just posted code to do the same over at your blog. Doh! @ Jeff, I forgot about PivotTable.VisibleFields, which you use here and which doesn’t cause me the same problem with DataFields that I mentioned above and in my post. Hi, reading the post on Pivot tables now realize that this is something I could use to great effect. However I need some help please, the code below is recoreded and I have modifid the way it renames the sheets, after selecting the data in each cell in the Piviot table Range in the totals column on PT. The problem that I have the report I run the Macro on changes every time its run and errors occurs on the Pt.RowRange this may have 10 row or 20 rows depending on the data. Is the a away to do the same function that I have recorded and not stop the Macro from working by selecting all the cells in column B and not include the grandtotal row? Your guidince would be appriciated. This is awesome tutorial! I simply loved it.. thanks! You get an error on that 2nd debug.print statement. This is weird. I don’t want the pt to go out of scope, because I’m half way through iterating through a whole bunch of visible fields. The reason I move it is that I want to alter it, and need to make sure I don’t overwrite any data a user might have put around the outside of the pt. I guess I can just move it to ZZ1 on the same sheet, do my thing, then move it back. But this had me scratching my head big time. You come across this issue? If you move an object from place to place around its worksheet, it’s the same object. When the object is moved to a different sheet, it is actually deleted from the original sheet and a new copy of it is created on the new sheet. You have to use an elaborate system of Set MyObject = NewObject commands to keep track of the object. This goes for pivot tables and charts, and probably other objects as well. Cheers Jon. Yeah, that’s what I thought. Problem is I’m moving the pt in the middle of a For Each pf in pt.pivotfields loop. Your suggestion creates a new object – and he original pivottable object still goes out of scope – which breaks the loop. So I’ll just move it to a vacant part of the same sheet and do the fiddling with it there, then move it back. By the way, the new blog theme looks good but it’s REALLY annoying to have to click the Show More Recent Comments button 7 times just to get to the most recent comment. I was going to suggest using a copy of the pivot table on the new sheet, so you knew how large a range it covered, but that would require making all the changes twice. Inefficient. I was also getting annoyed at all the clicking, so I’ve changed the setting to show 100 comments per page instead of 40. Hi Jon, just looking for some advice as struggling a little bit! I provided a subtotal by including another pivot field (“Code”) with multiple pivot items (“A” and “B”), with subtotals for the field. I arrived at a solution in a far more convoluted manner based on searching for the text ‘total’ and ‘grand total’ in col A. Probably 20 lines of code as opposed to 2! Would it be possible to take your solution a step further / make it more flexible so that I dont have to specifically refer to items A & B, i.e. I always know there will be two data sections but don’t know what the items names may be called? As I’ve about a 100 different pivot views of the data to construct with pivots of varying layout and which will expand to the right over time I’m looking to build a color scale applicator tool I can rely on 100%! to get the pivot items, and use a loop to Union them into a discontiguous range. I thought you might have been able to test the PivotCellType of the cells in the pivot table, and include only xlPivotCellValues, but in a quick test, cells in subtotal and grand total rows and columns are of type xlPivotCellValues, not xlPivotCellSubtotals or xlPivotCellGrandTotal. These only include cells in the row or column ranges that indicate subtotals or the grand total. You could still loop through the row and column areas and use these to exclude rows and columns, but it’s less straightforward than I would have expected. Wasn’t aware that a Pivot Item has a Data Range property so thanks again and apologies for swamping your blog! This would run a bit more quickly. I have limited vba knowledge. Please help. This is a little off-topic from the article above. Following guidelines in Getting Answers For Your Excel Questions, please submit your question to a dedicated Excel forum. I’ll simply add my words of appreciation for this tutorial: Awesome! Very useful explanation which I frequently use. Thank you!!!! This is great stuff. I’m currently using some of the code in this post to custom format some pivot tables that I produce. What would be the code if I wanted to select the Column Grand Totals so that I can bold the totals and the label? I’m trying to use the complex range selection in Excel 2010, but here it seems it does not work anymore. I have tried it in an Excel 2003 set-up with the same vba coding and there it works. I assume with the changed pivot tables in Excel 2013 your vba coding doesn’t work anymore. Do you have another suggestion to make such a selection? I was wondering whether it’s possible to retrieve the row value that is shown in a pop-up when hoovering over the pivot items. I haven’t looked into this recently, but I have been frustrated by Excel 2010’s insistence on not using the Tabluar pivot table layout by default. I always have to go back in and change it, usually after wasting a little time on the table. I assume some of the other layouts, with labels for different fields being combined into single cells, causes errors in some of this code. Just this morning I figured out that it had to do with the way the pivot table is being presented. Thanks for validating my guess. I am VERY new to VBA programming and I have some Basic, Fortran and C++ training from about 15 years ago. In addition, I currently use SAS and have have used STAT and SPSS in the past. I am trying to “automate” some regular reporting that I have to do for work. Basically all I am trying to do is copy and paste the values from a pivot into cells on another sheet that have been linked to graphs. I figure out how to do that. What I want to do now is figure out how to use the value in the pivot page filter to determine which sheet in the workbook and which location on the sheet the data gets pasted to. In my code below I am selecting a cell and changing the cell color based on the value of a particular pivot page filter being equal to all. I am just doing this as a test of my if statement. Once the if is working I will use it to assign a value to a variable. In the corrent format the if statement functions properly with a simple conditional statement, but not when the pivot table is involved. Does the code stop at a particular line? What error message do you receive? I forgot to include that I am working in excel 2010. Always helps to check the Object Browser. A PivotItem is one of the choices you have for the value of a PivotField. When I try that I get a compile error, “Expected: list separator or )”. The word Accessible, in the line below, is highlighted when I get the error. Make sure everything is spelled correctly, and that the quotes are real double quotes, and not the curly quotes that blog software enforces. Thanks Jon! You are really amazing. I did have the curly blog quote as you suggested. Now, my if statement doesn’t trigger an error but the code within the if-statement doesn’t get executed. do you have any thoughts? ActiveSheet.Range(“F9″).Interior.Color = RGB(0, 255, 255)? I have not yet done anything meaningful with PowerPivot. Do your own exploring, with the Object Browser, the Immediate Window, and a good web search tool. Hi Jon – thanks again for such an invaluable resource – I’ve used this to great effect on a survey to ensure consistency of information across multiple pivot tables on a single worksheet (60+ pivots). In the examples you have given, selecting the ‘DataBodyRange’ will include the GrandTotal, which I don’t want to do – instead I just want to apply the databar formatting to just the 13 thru’ 1 values – but I can’t see to identify the object level range to select – the rest of the code works a dream, I just can’t tie down the data range excluding the total row (I don’t want total’s switched off). & Err.Description, vbExclamation + vbOKOnly, "Error"
pt.PivotItems.DatabodyRange.Select ‘<===== this line is broken, but does work if using pt.DataBodyRange.Select This gives you an error because (1) the hierarchy is pivot table - pivot field - pivot item, and (2) you would need to specify which pivot item using PivotItems(x). To exclude the subtotals, you can assign the DataBodyRange to a range variable, then resize this by one less than the number of rows and/or columns, as appropriate. Use pt.RowGrand and .ColumnGrand to check whether there is a total row or column. How would you reference a column in a Pivot Table with multiple Value fields? For example, each year had the order amount values you originally gave, and they also had a column of something else by year (maybe a count or something else). I’m trying to reference jsut the count column within a specific year and month. I’ve been using combinations of Intersect to no avail. Firts at all, my congrats for very useful post. Merge, Sort, and delete dupicate IP ranges.? I’am working in ipfilter tool project, and think perhaps pivot tech can do easier my job. The difficulty is that pivot tables can group or sort by numerical values, but IP addresses are strings comprised of four numbers delimited by periods. You could probably split the IP addresses, pivot on these, and then manipulate the resulting output to generate the affected IP addresses. The ‘For Each’ loop will go through each cell, and the last cell saved will be the grand total. I don’t think this is a repost, rather it is a bit derivative of some earlier posts. I hope this helps. Unique approach. This gives the value of the last cell. One comment: don’t use “pvtItem” as your loop variable, since its name implies it is a pivot item, and it’s a cell. Declare the variable as a range and use an appropriate name, like rPTCell. Of course, this only gives you the bottom right cell, whether or not the pivot table has row and column totals. You’re right, I used split in the app I developed with VS2008, and it works well. Only looking for other ways to approach the same problem, (sort IP addresses). You imagine the following scenario. The app downloads blacklists which contain IP ranges in a text file, from different sources. These blacklists are classified by filtering levels. IP Range alredy exinting in ipfilter file. New IP address blacklisted, for to be added to the ipfilter file. The adjusted ipfilter file is saved in another application that used it to filter these ip, obeying the filter level for each one. I must add that these ips are ranges that for one reason or another, we should not connect with them. At the moment only one access levels are implemented. A value below 127 means that any connection-attempt is denied. If anyone is interested in this topic, here is an interesting link. Jon, this tutorial is awesome. Thank you very much.Just one question. If I want all the hours and costs of the below section, how would I write it? The closest I can think of is this, but it doesn’t work. Actually, Jon. It did pretty much work. I just had to set that intersect to a range, and then use copy destination:= to paste it into another range. Cheers, you can delete the previous post. Excellent article. Very useful. Thank you. my databodyrange if it is “Good” then it should be Green and if it is “Bad” it should be Red. Please help me with code.. I didn’t find your web site while I was learning to handle pivot tables in VBA, but I sure would have learned faster ! Working in an international company, people from other countries will use the macro I wrote. But as the spelling of the months will change with the location of the computer, the user needs to change the Tabl_Month() and write it with his language’s months -> it’s not convenient as users don’t know VBA. Do you know if we can, using a macro, ask excel to create the pivot in a specified language ? 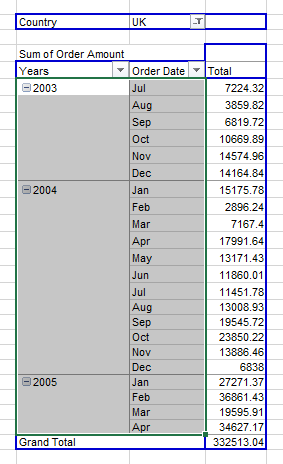 The procedure below extracts the months from the “Date” field in my pivot table. Presumably this will return the month abbreviations for whatever language you’re using. I tried changing ‘sCaption = pi.Caption’ by ‘sCaption = pi.Value’ or ‘sCaption = pi.Text’. I really think this is the way to do what I want and I will dig further, thanks a lot ! Yeah OK I figured out how to do it ! with a loop over ‘year’ to select any year that appear, I don’t care which one. And so it gives me the months as they are written in the excel sheet. Glad you’ve figured it out. VBA keeps two sets of formulas, one in the local language and one in US English. It must also somehow keep two sets of the month abbreviations. Your trick made VBA find the actual values in the cells (the local values), instead of the internal US English values my approach provided. I’m trying to create an automated function that creates a separate sheet for a pivot grand total. My page has five separate pivot tables on the one page, each requiring a page created separately. The double click that pulls all the information into one page is the manual version. How do I name the separate cells and individual tables? As these cell references often change due to changing data I’m frankly flummoxed. Thanks for your guide – it’s really useful. How can I reference the value (i.e. PivotItem) in a PivotField? Using your example above, the Country field in the report filter is set to the UK – how do I reference the ‘UK’ value? I obviously don’t want to specify the UK, but rather whatever value is selected. I therefore can’t have a static value of ‘UK’, but need something dynamic that would work regardless of any changes to the PivotField selection. create a pivot table with 2 data fields. Create a single row field. Make sure there is no other column field, other than the Data Fields. Now you’ll find that all the pivotitem ranges relating to the Row pivot field are one row too low. Now add another column field over the data fields. It all works again as expected. I harvest data on a monthly basis into Excel. Each new page is named with the import date, and the import date is also stored in Range “O2” on each monthly import page. My Pivot collects data from 4 different pages, and they are renamed to ‘Rådata-IKT’, ‘EnRapp’, ‘ToRapp’ and ‘TreRapp’ in order to be able to collect the data. All other pages are still named with their import date. does not work as the ‘old-name’ constantly changes because I rename the pages as described earlier. Anybody, please help me out. I wanted to copy paste the pivot data by automatically selecting the pivot items one by one whatever the list of pivot items available in pivot field. The pivot items can be anything numeric or alpha or alphanumeric.My pivot items in pivot field are also not being same every time it keeps on changing. Hope I clarified my questions. If I you could get some help with below question I would appreciate it. I have a flat pivottable (no DataLabelRange) and nothing in my filter. The pivottable has region and country in my RowField and 3 values (AmountUSD, AmountEUR and Hours). Now when I use “pt.PivotFields(“Region”).PivotItems(“APJ”).DataRange.Select”, my range is offset by 1 row. And is it save to simply due an offset(-1,0) on this range? Considering multiple users with different systems, but who will not change, only update, the pivottable. This post is quite old now, but I hope you will see my question. I’m really stumped!! The article above is fabulous and has helped me many times. What I am struggling with is how to select the DataRange when there are multiple row labels. I want all of the DataRange for all of the RowLabels but without the Labels themselves. I’ll try to post a pic. I would like to select both the ‘Years’ and ‘Order Date’ DataRanges. No amount of searching or trial and error has been successful for me. Any suggestions? Thanks!! I am trying to write a code that would find the PivotTable associated with the source data. I am stuck up at a very early stage! Any help would be greatly appreciated. Is there a way using VBA to go to the relevant cell (i.e. trace precedents) though the GetPivotData formula? Your code may break down because PT.SourceData is returned as a string, as the address in R1C1 notation. You would need to use Application.ConvertFormula(PT.SourceData, xlR1C1, xlA1) to get the address that Range() will find palatable. I can’t imagine a more direct way to trace the precedents of a pivot table value. Of course, if you double click on a pivot table cell, a new sheet is inserted that lists all the records of the source data that the cell is based on. I’ve come across a strange difference between PivotFilters and CurrentPage. I’m using an ActiveX calendar control embedded in a user form to pick specific dates to use as filters/pageby values for a number of pivot tables. The difference I am seeing is that PivotFilters will accept the date as string in format dd/mm/yyyy but CurrentPage will only accept the date as string in format mm/dd/yyyy. I’m also finding that pivots where I have changed the CurrentPage value are not updating. Has anyone else experienced this? Any ideas on the CurrentPage format difference or the pivot(s) not refreshing? What are your regional settings for date format? And by “accept” a date, do you mean “display” a date, or is this something about how you are controlling the filters? I don’t know why the Filter (Page) fields would treat dates differently than Row or Column fields. I usually avoid ActiveX calendar controls because of reliability issues (ActiveX issues, plus not guaranteed to be installed on every computer). Is there a reason not to use the filters on the pivot fields, other than keeping multiple pivot tables in sync? Have you tried using a Slicer or Timeline? These are relatively new, Slicers introduced in Excel 2010 and Timelines in 2013 (I think). Either let you filter like fields in multiple pivot tables that use the same pivot cache, so you can sync them without the need for code. Great coding :) thank you very much. I was wondering; is it possible to reference the pivotfields through their sourcename instead of the name? however, i’m having trouble in my pivot table with code to highlight header and rows data below itself with variable number of rows. Do you mean you want to highlight data outside of the pivot table? You can use TableRange1 or TableRange2 to find the extent of the pivot table, then either count N rows below that, or look for the next row(s) below that with data. Do you want to select a range with multiple areas? Find your ranges, called Range1 and Range2, which can be inside or outside the pivot table, then use Union(Range1, Range2) to reference the combined range. Some data in the copied sheets are getpivottable formulas. When the array creates the copied sheet any data in these cells are zero, not the pivot table amount. How can I address this in my VBA so the data comes over? Using a simple data set and pivot table, with uncomplicated GetPivotData formulas, and a one-liner in the Immediate Window, I could not reproduce your problem.